The injured student was rushed to Adaspur CHC and later, shifted to SCB Medical College and Hospital where her condition is stated to be stable. CUTTACK: A girl student of Uday Nath College of Science and Technology at Adaspur in Cuttack district was critically injured after being stabbed by a motorcycle-borne miscreant while she was on her way home on Tuesday. The injured student was rushed to Adaspur CHC and later, shifted to SCB Medical College and Hospital where her condition is stated to be stable. As per reports, the victim, a student of Plus Three Second Year Arts was returning to her native Firifira village under Balianta police limits after attending classes on a bicycle when she was attacked by the 21-year-old accused Rajesh Behera, a resident of Nankar-Deuli. The girl was abused and thrown to the ground and stabbed with a knife repeatedly by the accused who fled as some students rushed to the spot. The victim sustained injuries on her hand, leg and waist. Cuttack Sadar SDPO Jitendra Kumar Dalei said though the exact cause of the attack is yet to be ascertained, one sided love affair is suspected to have led to it. Based on an FIR lodged by Umakant Das, the victim’s father, a case has been registered and investigation is on, he added. 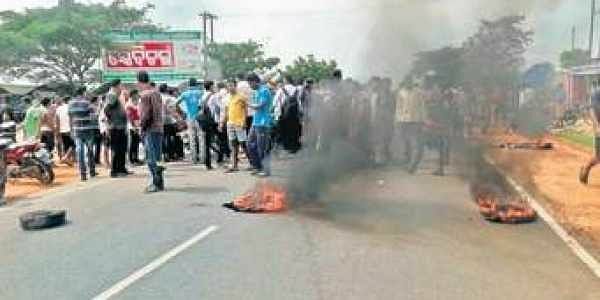 Following the incident, residents of Firifira village staged a blockade on Phulnakhara-Niali road at Barhipur demanding immediate arrest of the accused. The blockade was withdrawn after the local police assured the agitators that the accused will be arrested within 12 hours.